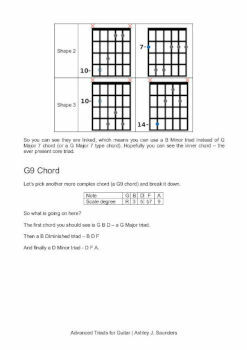 Once you've masted the basic triads, then shift gears and explore Advanced Triads for Guitar eBook. While this ebook is not for the faint-hearted, it will change how you see music and harmony in general. So if you want to play better using less, then this eBook for you. Once you're happy with the basics of Triads, we can start to explore the many uses we have available. 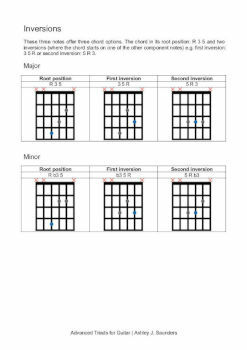 As an advanced book, it follows the first Triads for Guitar eBook. So start here. 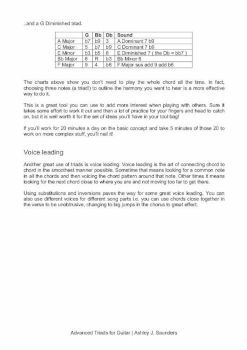 We will explore in Advanced Triads for Guitar eBook, how three simple notes can be used to transform your guitar playing. Triads enable us to use less to create more. Also, we can stack triads and superimpose them on top of each other to create new harmonic ideas and tensions. 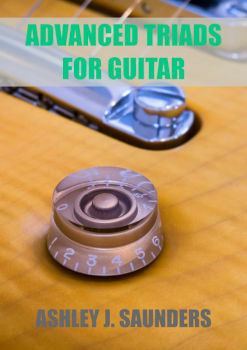 Please note, this is an advanced ebook for guitar. So, not for the faint-hearted! This advanced eBook is aimed at those who want a deeper understanding of harmony on guitar.